The financial crisis has highlighted the need for comparability in financial reporting globally, and for increased audit committee oversight of that reporting. High-priority areas include fair value and financial instruments. 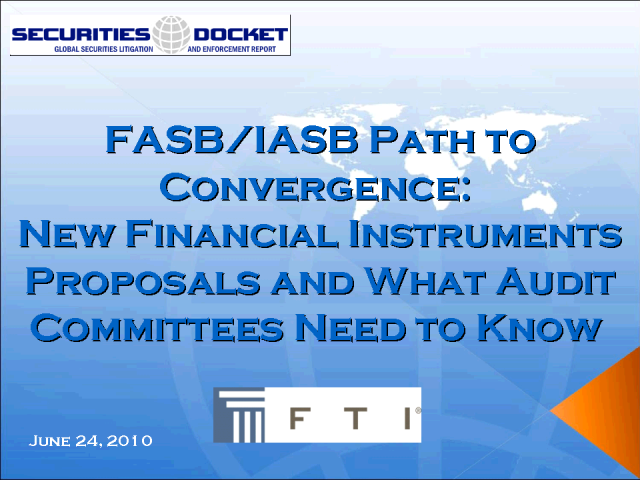 To improve comparability in those areas, the Financial Accounting Standards Board (FASB) and its international counterpart, the International Accounting Standards Board (IASB), have been working jointly on projects to converge U.S. GAAP and International Financial Reporting Standards (IFRS), with mixed results. This webcast will provide an overview of the FASB proposal on the accounting for financial instruments, the potential U.S. GAAP/IFRS differences, and what audit committees need to know so that their organizations are in position to become part of the process to improve that reporting going forward.